The AceGrip Orange General Purpose Latex Coated Gloves (Case of 120 Pairs) are tough, general purpose, premium quality gloves suitable for a wide variety of applications. The seamless 10 gauge polycotton liner featured with the AceGrip Orange General Purpose Latex Coated Gloves is soft and comfortable for the wearer. 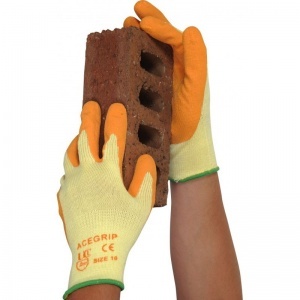 The crinkle finish latex coating on the AceGrip Orange General Purpose Latex Coated Gloves give excellent grip, good durability and resistance to abrasion. Sanitized hygiene function brings increased freshness, comfort and protection. Through this listing, you can purchase the AceGrip Orange General Purpose Latex Coated Gloves in case quantity, getting 120 pairs of gloves at a discounted price. Ideal for businesses and local authorities of every size, this Bulk Pack allows you to save money on your essentials. To purchase these gloves in single pairs or for more information, please see the standard listing.